2.3 Can flaxseed be poisonous? Common noun: Flax, Common Flax, Cultivated Flax. 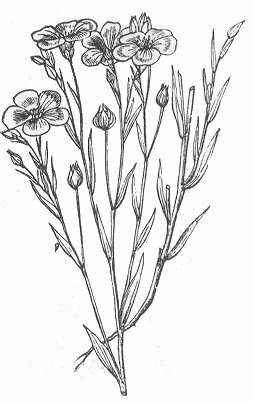 Annual herb of the Linum family – Linaceae up to 60 cm. Generally single stems. Lanceolate leaves with three nerves till 4 cm long, 4 mm wide. Dark blue flowers, till 3 cm in diameter, gathered in very loose racemes. Fruits (linseed) till 1 cm. Habitat: Cultivated long time ago like a textile plant and for its seeds. Today it can be found like a naturalized plant in some dry places, rich in organic waste. 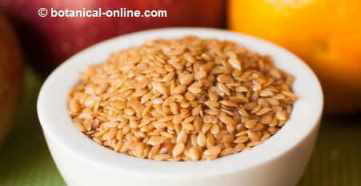 – Laxative: The seeds, once dry, are known as linseed. These, used internally, are very useful for their laxative properties to treat constipation, either eating them raw, blended with abundant water (about 1 to 3 daily spoonfuls a couple of times to the day together with at least 8 glasses of water a day), or by means of cold infusions (A spoonful for a cup of water. A couple of cups a day). Taking this remedy can be a good way to prevent diverticulosis. – Softener: In the same way, for its demulcent properties, this very preparation has a reparative and protective effect on the gastric and urinary membrane, so that it has been used to combat the stomach irritations or inflammations of the digestive or urinary tracts in general, especially in diverticulitis (inflammation of the colon), irritable colon, or cystitis (inflammation of the bladder) or nephritis (inflammation of the kidneys). It is also very useful for its mucolytic properties by helping to eliminate the secretions that take place in the respiratory tract as consequence of cold, bronchitis, pharyngitis, etc. – Anti-cancer: The ingestion of foods that include these fatty acids helps to prevent the appearance of tumors in the chest and in the skin. Also there is much research about the possibility that phytoestrogenic lignans may be effective in the cancer decrease because of their antioxidant, antiestrogenic and antitumoral properties. – Alzheimer disease: It is suspected that the lack of fatty acids could be one of the triggers of Alzheimer’s. Analysis in patients with this disease show low levels of fatty acids. Supplement intake of essential fatty acids omega-3 and omega-6 could improve the evolution of the disease (Take it according to the patient’s leaflet). – Macular degeneration: Essential fatty acids prevent macular degeneration and help in the formation of vitamin A from carotenes. (Take it according to the patient’s leaflet). In external use, one takes advantage of its demulcent properties (it softens and protects the irritated parts of the skin) It also has emollient properties (It softens the skin, forming a layer on it that impedes the evaporation of water). Equally the oil of this plant is used externally to cure affections of the skin. You can use it in the same cases we saw above or in different ones such as burns or baldness (In the first instance, apply a layer of oil diluted in the same proportion of water on the burnt surface; in the second one, one should carry out a daily lotion of one’s hair with the flax oil diluted in the same proportion of water. Flax seed oil can also be used to treat nail fungus. 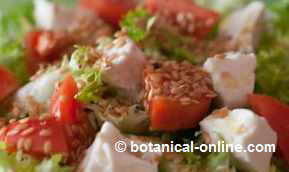 To treat bronchitis externally make a poultice of linseed flour. 50 g. Of flour per cup of water. Place the dough on cloth and place it on the chest. Flax has been cultivated from the antiquity for the extraction of fibers and oil. Flax oil is used fundamentally in the industry of paintings and varnishes by its capacity of quick drying, because it forms a protective layer on the painted surfaces against environmental factors. We use it to protect wood, iron or other exposed materials. This same oil enters as one of the main components in the production of the linoleum, a type of waterproof product that is used to cover floors. Fiber is obtained from the stem. The process can be carried out industrial or manually. In the last case, the plant is cut and exposed to the environmental conditions so that the natural fermentation decomposes it and allows to separate the vegetable fiber from other refuse. With this fiber, after some different manual processes, a natural thread is elaborated that is used for the production of a cloth similar to cotton, although stronger, smoother and as fresh and absorbent as this. As a textile fiber, flax began to be cultivated about 5,000 years ago. It was very important in the Egyptian empire, where mummies were buried with linen cloths. Later on, the Romans extended its cultivation. It was most used during industrialization. Later on, the discovery of synthetic fibers and the predominance of cotton cultivation relegated it to a second term.